For those of you who are under 50, Bullwinkle is a moose in an animated television series called The Adventures of Rocky and Bullwinkle. Baker did some research and as it turned out, he hit the description of the condition right on the nose. It's called Bullwinkle Syndrome and it's something Lindsay Thomas, Jr. of the Quality Deer Management Association has been seeing for about the last decade. "The first one we were aware of in trail camera photos was maybe 10 years ago," Thomas said. "I'd say around 2005." "This thing is very rare. It's a half-dozen or less that I'm aware of." It's also something relatively new to biologists as it was first documented only 12 years ago. "This is something that was not encountered in the 1900s," Thomas said. "That does not mean it did not exist before that." Thomas said the documentation of Bullwinkle deer could be the result of modern technology. Game cameras fill the woods these days and hunters can quickly share photographs through social media. Prior to 2000, this technology was relatively rare. What exactly causes the condition is a mystery. "It's still unknown," Thomas said. "It's suspected it's a bacterial infection or inflammation of some kind." However, Thomas said the specific bacteria has yet to be identified. According to QDMA's website, here is what is known about Bullwinkle Syndrome. The swollen snouts are the result of long-term inflammation of the nose, mouth and upper lips, and similar colonies of bacteria have been found in deer affected by the condition. The bacteria causing it has not been isolated because samples have been in poor condition or contaminated by other bacteria. Also, where and how the deer acquired the bacteria is unknown. Although the condition appears to be uncomfortable, it does not seem to be fatal. 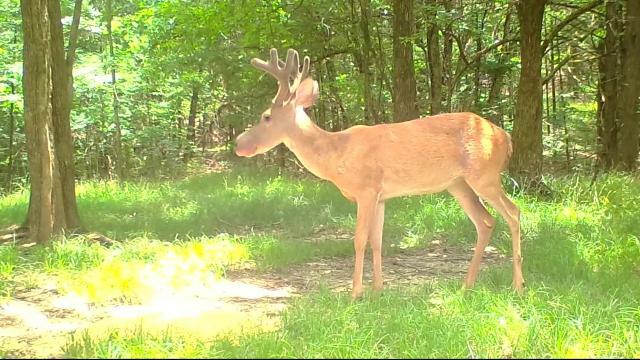 QDMA stated photos of deer with the condition show an otherwise healthy animal. In the case of Baker's buck, it has been photographed over a period of about seven months and other than looking like a cross between a deer and a moose, he seems healthy. The cases are isolated and very spread out. They have been documented as far north as Michigan and as far south as Georgia. Because of this, it is felt the bacteria isn't easily spread from deer to deer, if at all. That, along with the fact that there are no recorded fatalities from the condition, leads Thomas to believe hunters should not be concerned if they encounter a Bullwinkle on their land. "It seems random, sporadic and widely scattered," Thomas said. "It is not a population concern." Eating meat from a Bullwinkle is another matter. QDMA points out there may be secondary infections in muscle tissue or the culprit could be in the bloodstream. As such, the organization does not recommend eating meat from an infected animal. 18 Attachment(s) Go to first new post Brain dead, fake news..